Compulsive neatnik Felix Unger (Jack Lemmon) is thrown out of his house by his divorce-bound wife. He wanders aimlessly through the streets of New York, toying with the idea of suicide, before gravitating to the apartment of his best friend, incorrigibly sloppy sportswriter Oscar Madison (Walter Matthau). Worried that Felix will try something desperate, Oscar, himself in the process of being divorced by his wife, invites Felix to move in with him. Within a few days, this mismatched pair is on the verge of mutual murder: Felix cannot abide Oscar's slovenliness, while Oscar is driven insane by Felix's obsession with cleanliness. A potentially passionate evening with Oscar's neighbors, the coo-coo Pigeon sisters (Monica Evans and Carole Shelley) is ruined when Felix, ruminating over his wife and children, reduces the two ladies to remorseful tears. Pushed to the brink, Oscar stalks around the apartment making as big a mess as possible. Comes the next week's poker game, and the previously vengeful Oscar is worried that Felix might have attempted to do away with himself again. Instead, a surprisingly self-confident Felix shows up to collect his belongings, then announces that he's temporarily moving upstairs with the toothsome Pigeon sisters! There's a laugh a second in this faithful movie adaptation of Neil Simon's hit Broadway play. A foolproof comic situation (allegedly based on a chapter in the life of Simon's brother Danny) is kept alive and healthy by some of the funniest dialogue ever written. 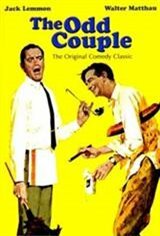 The Odd Couple was later adapted into a long-running TV sitcom starring Tony Randall and Jack Klugman.